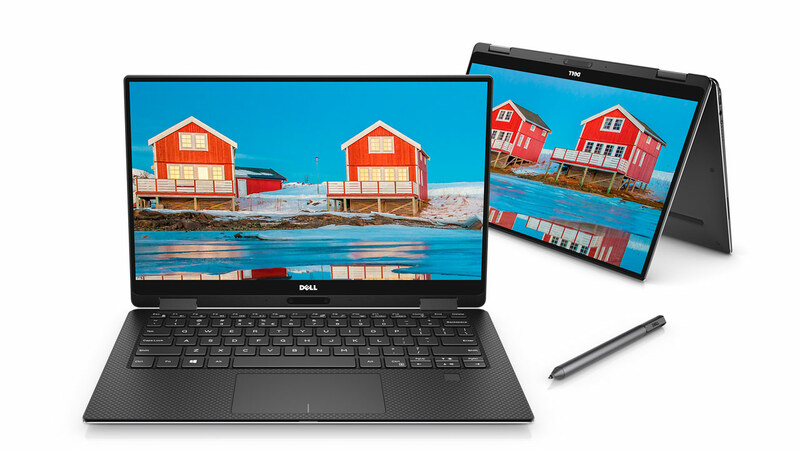 During CES the US manufacturer Dell announced a new convertible based on its popular XPS 13 laptops. The Dell XPS 13 2-in-1 comes with a 13 inch display that can be rotated onto the back of the keyboard with a 360 degree hinge. Besides most recent specs it features a fingerprint reader, an optional stylus and a very slim design. As you might expect, the Dell XPS 13 2-in-1 is a bit more expensive than its standard laptop style brother. It’ll be available in the beginning of January in the US starting from 999.99 USD and goes up to 1799.99 USD for its highest end version. While it has not been announced for Europe and other markets yet, it should be available pretty much everywhere soon. As the name suggests, the display is 13 inches big and has very thin bezels – Dell calls it an infinity edge display. You can get it with a full hd resolution at 1920 x 1080 or a quad hd resolution at 3200 x 1800. One nice option is the Dell Active Pen, a pressure sensitive stylus that supports 2048 pressure points – just like the Surface Pen from Microsoft. The convertible is made out of metal and is pretty thin – starting from 8 to 13.7 millimeters. There’s no room for a full size USB port so you get USB Type C instead, as well as a Thunderbolt 3 port and microSD card slot. An adapter to full size USB is included – very nice. What’s quite interesting is its fanless design. Unlike most 2-in-1 it does not have any fans at all. The reason? Inside runs Intels new Core i Y-series Kaby Lake chips. Inside Dells XPS 13 2-in-1 runs an Intel Core i5-7Y54 or Core i7-7Y75 – depending on the version you’re getting. Sounds very promising but in fact the Core i Y series of Kaby Lake chips used to be called Core m5 and Core m7 a year ago. They’re not as powerful as U series chips that we usually see in higher end notebooks and convertibles but the Y series does not require active cooling. The folks over at Laptopmag already published a review of the Dell XPS 13 2-in-1. According to there benchmarks the processor in fact is a bit faster than other devices running the same chipset thanks to Dells “Dynamic Power Mode” which increases performance a bit. It’s still not as fast as a U series CPU though. As usual you can get several versions of the device. You can get 4GB, 8GB and even 16GB of internal memory, as well as a SSD that has a capacity of 128GB, 256GB or 512GB. What do you think of the Dell XPS 13 2-in-1 so far? Sounds pretty interesting to me and I hope I can check it out soon.